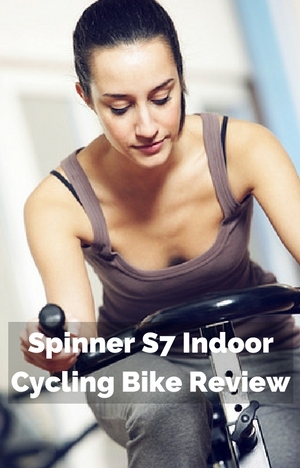 The Spinner S7 Indoor Cycling Bike is the top bike in the new Sport Series. It is designed for the home. By the originators of the spin bike. It has a heavier flywheel, dual pedals and double water bottle holder over and above the other bike in the series which is reflected in the price. It is designed with the serious athlete in mind but it can be used by a beginner too. The bike also has a fully adjustable seat and height adjustable handlebars, friction resistance and chain drive to help provide a good cycling workout experience that is low impact. 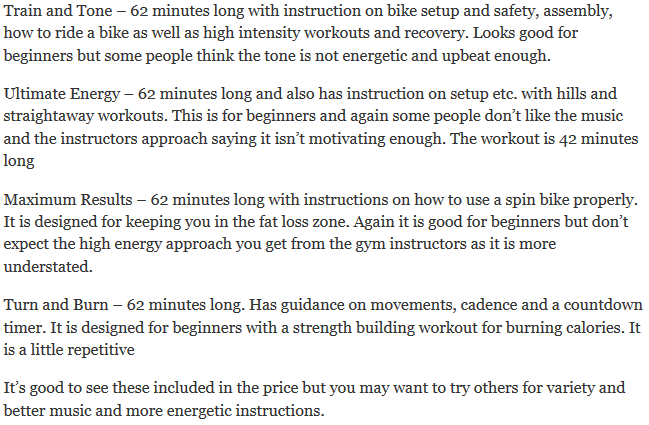 As well as looking at how well the bike meets the demands for aerobic and cardio workouts I look at how well it will fit into a home in my review below. To help with moving through the review you can click on the contents table below rather than scrolling down through it. First up is looking at how durable and stable it is. The rectangular frame steel tube and stabilizer bars keep the bike stable and rigid at all amounts of intensity whether you’re in the seat or out of it or moving in between. It keeps everything all steady so you can just get on with training and working out without any concerns or distraction. If your floor is a bit uneven there are 4 levelers under the stabilizer bars that you can turn to balance out the bike to prevent it rocking from side to side. There is a 1 year warranty for the bike (excluding labor) which is okay – it’s not the best but nor is it the worst. It has a good solid construction that should keep you exercising for many years to come and bikes from Spinner have a good reputation on the whole for being able to stand up to the punishment of tough workouts. The bike can be adjusted to accommodate riders between the heights of 4ft 10 ins and 6ft 7 ins. The handlebars can be adjusted vertically to set them at the most comfortable height. For most people the lack of horizontal adjustment won’t be an issue to get a good fit. The horizontal adjustment can help some people to not feel cramped or stretched and get it set up closer to their outdoor bike. The adjustment relies on pre-set holes in poles to keep everything in place – which prevents the poles from sliding down as you workout. It does also mean that you might not quite get the setting you want. Making the adjustments are quick and easy to do so it can conveniently be used by multiple people – it only adds seconds to the preparation time before a workout if it has been adjusted since you last used it. There are markings on the poles to make it easier to return to your setting once you’ve sized the bike. You can also mark up the poles with permanent marker for your personalized settings. To increase/decrease resistance you turn the tension knob at top of the frame. It pushed directly on to a leather pad that sits on the flywheel. This gives a good consistent pressure on to the flywheel. The leather pad is harder wearing than felt wool pads but can be a little noisier and they can squeak. The squeak can be sorted with a drop of oil from time to time. You get incremental changes in the resistance on a continuous scale from very easy to very hard. You can set it to where you want. Like most bikes it doesn’t have a scale marked to help you set the level you want. You have to do this through your own experience and estimate. This is normal. If you’re not used to it might take a little getting used to but doesn’t take long. With it using a leather pad it will wear down over time and need replacing. Replacement pads can be bought from Spinner and the instructions for replacing are included in the manual. The resistance pad has a guard over it that prevents sweat getting to it thereby extending the life of it. This also helps to divert sweat away from the flywheel too helping to extend the life of the wheel and resistance. It has chain drive that turns the 35 lb weighted flywheel. You get a similar feel as to riding on the road with pedals being pulled through and the chain pulling on the sprockets. It makes for a more natural feel. The pedaling motion is smooth with the inertia of flywheel providing a 360 degree pedal motion with minimal choppiness at the different levels of resistance. The chain feels like and sounds like an outdoor bike, which also add a little maintenance requirement too It may need to have the tension adjusted and lubricated occasionally as described fully in the manual. It’s less than a road bike because it’s used indoor and you don’t make gear changes. It has a fixed gear so that when the flywheel is turning so are the pedals which prevents you from coasting or freewheeling. To get off the bike you need to gradually stop the pedals so as not to stress the joints or if you need to stop fast you can push down on the tension knob to use the resistance pad as a brake. The chain is protected by a guard that helps keep your ankles away from the chain and children or pets but also stops dirt and sweat getting to the chain. The dual sided pedals can be used with athletic shoes on one side and the other with SPD compatible cyclist/specialist shoes. The side for use with athletic shoes has toe baskets with straps so that they can be adjusted to give the right fit for your shoe size. This helps give a good grip to keep your foot on the pedals properly to push and pull around the pedaling cycle. This does make the bike useful for people with a range of fitness abilities and attitudes – from the beginner to the serious. You just flip the pedals over to the side you want and off you go. It has a narrower q-factor (horizontal distance between pedals) than most spin bikes or indoor cycle. This helps with keeping legs more aligned which will feel more like riding a bike and more natural. Seat. It has a cushioned wider seat to help with comfort and balance. Despite this not everyone is going to be happy with the seat. That is just the way it is with any bike seat – indoors or out. If you’re not used to riding a bike it does take some time to get used to them but sometimes it is more than that. If that is the case you can try padded bike shorts or gel seat cover to add some more comfort. Also, you can replace the seat for one that is more to your liking as it will fit any standard bike fitting seat. Handlebars. The handlebars are covered and oversized to provide a secure grip at all times including when your hand get sweaty. It will also prevent blisters. They have the standard style of handlebars for the hand grips for spinning workouts. There aren’t any dropbars or aero bars for more options for indoor cycle training. Noise. The bike isn’t silent. But it doesn’t make a lot of noise when being used – you have to stop the shushing like sound of the leather resistance pad on the flywheel (needs oiling from time to time if from squeaking) and chain soft clinking sound as it moves across the sprockets. You’ll need to turn up the TV a little to hear – a couple of notches or so. People in another room won’t be too disturbed by your workout. Cleaning. The biggest amount of cleaning involves cleaning up sweat that’s dropped on the bike. There are guards over some of the more important parts to protect them and to make them easier to clean. It’s advised to do this after each exercise session. It only takes a few seconds. Sweat will also drop onto the floor and the best way to protect this is by putting the bike on a rubber exercise mat. You might also notice a little dust from the resistance pad and some lubricant from the chain. The bike needs an area of 18 by 43 ins – so is quite compact for a spin bike but still too big for most closets. The titanium coloring and styling will look fine against a wall or under the stairs. There are 2 small transport wheels at the front of the bike that you tip the bike onto when you want to move it. One person can do this on their own. The wheels have plenty of clearance so will work well no all but the softest surfaces. If you have wood floors these type of wheels can scratch or dent them so you may want to check before you move it across the floor and damage it. They take on most of the weight of the bike leaving you to wheel and balance the bike where you want it to go. Tipping is easy as well as most of the weight is at the front of the bike. The bike arrives in a big box with it partly assembled. The hardest part of the assembly is moving the box and getting the parts out of it. The bike weighs 100 lbs when assembled. To help with handling the weight it can be a good idea to have a second pair of hands.. Otherwise it is a straightforward process. The instructions and diagrams are clear. All the tools needed are included, although it is easier with your own wrenches/socket set and Phillips screwdriver but they aren’t necessary. The frame and drive have been assembled. You are then required to add the pedals, posts, seat, handlebars, stabilizer bars and water bottle holder to this. It normally takes between 1 to 2 hours with some people able to finish much quicker. The bike doesn’t come with a console. This is normal for spin bikes. That is how many prefer it, it seems. They can use the music, the instructor and their experience to stay on track and get the workout intensity they want. Personally I like the reassurance of the numbers and also I like to track my numbers. There is a computer you can buy separately for the bike called the Spinning Bio Wireless Computer – it will monitor your cadence, speed, distance and calories. You can see these all at the same time. It doesn’t come with any programs or heart rate monitoring capability. When i checked the price was under $70 but was on back order. It is possible to add a bike computer to bike instead. It will take a little more effort and DIY skills to fit it to the bike. The common model people use are from the Cateye range.You may also be able to use App to do this but I’ve not checked this out properly. The bike comes with a couple of good accessories – dual water bottle holder and 4 spinning DVDS. But there is nowhere for media devices to be placed. The water bottle holder can fit 2 oversized bottles, so you should be set no matter how long you workout for. Being in the middle of the handlebars they are in easy reach and being gravity held there is no messing around when you want to grab and replace the bottle. You won’t be slowing down or having to take your focus away from your exercise. At present there are no reviews for the bike to assess how it is working out in people’s homes. It has just been released. Going on reviews from other Spinner spin bikes, overall customers find them of a good standard and get the workouts they are after – low impact cardio at the intensity they want without issues. As and when a customer leaves a review I will update this section to reflect the comments and ratings. You get a quality constructed bike with dual pedals, 35 lbs perimeter weighted flywheel, double water bottle holder and 4 spinning DVDs included in the price. You can find other bikes with more features but you don’t always get the same standard of construction. When I checked Amazon it qualified for free shipping and Prime. Thank you for the detailed review. Very helpful. Great to hear that you found it helpful. This was perfect. Costco no sells this model and needed an opinion. Thank you. You’re welcome. It’s great to hear the review helped. Thank you for a thorough review. Very helpful. You’re welcome. I’m glad to hear you found it helped you.